Miles Howie Sr., originally from West Virginia, had already painted most of the gas stations in his state by 1931. But he and his family moved to New Jersey where there were more gas stations to paint and better economic opportunities during the Depression era. 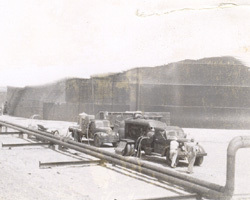 The West Virginia Paint & Tank Company was launched in a single room of a two-story brick building on the corner of Autumn Street and Main Avenue in Passaic, New Jersey. Miles Howie Sr. bought the building in 1944 for $20,000. By fall 2002, our company moved to nearby Clifton, New Jersey. 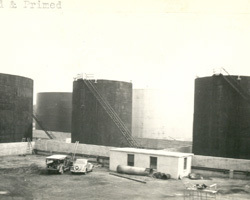 It is still owned and operated by the Howie family. In the new millennium, West Virginia Paint has become a $10 million a year operation with nearly 100 workers painting oil storage tanks from Maine to Bermuda. One of our tanks is flash-featured on the HBO TV introduction of "The Sopranos." It is the famous "Drive Safely" CITGO tank along the New Jersey Turnpike. Other tanks we have painted along the turnpike since 1958 include the Tosco tanks; Tosco is now owned by Phillips Petroleum. Our company has been featured in the Charleston Daily Mail (July 29, 2002). 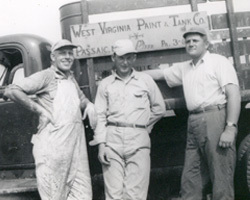 The article, "It's Jersey with a splash of West Virginia--Paint company has state's name, some deep roots," was written by Brent Cunningham. By 2004, we have ventured out into the World Wide Web. Our address is www.wvapaint.com.